BANGKOK, Thailand, 2018-Mar-21 — /Travel PR News/ — Tourism industry organisations and individuals making outstanding contributions towards the successful promotion of the travel industry throughout the Asia Pacific region are encouraged to submit entries to the 2018 Pacific Asia Travel Association (PATA) Gold Awards. The deadline for submissions is May 11, 2018. The Awards presentation will take place during PATA Travel Mart 2018 on September 14 at the Mahsuri International Exhibition Centre (MIEC) in Langkawi, Malaysia. 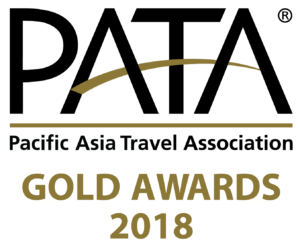 Sponsored by the Macao Government Tourism Office (MGTO) for the 23rd consecutive year, the PATA Gold Awards sets industry standards for excellence and innovation. This year’s awards will also include two new categories: Community Based Tourism (CBT) and Women Empowerment Initiative (WEI). Submissions for Community Based Tourism will be accepted for both CBT supporter or CBT initiative and judging will be based on the benefit of the initiative, impact on local community, awareness of the programme and effectiveness of the programme. The award for Women Empowerment Initiative will be presented to travel and tourism-related organisations or destinations that embrace initiatives that forge positive visibility in women. These include, but are not limited to, initiatives that demonstrate and promote equal opportunities for women; encourage women in leadership or women-led tourism projects; raise awareness about gender parity and contribute to advancing women; celebrate women’s diversity and social, political and economic achievements; provide educational activities for women to better improve their opportunities for working within the tourism industry; establish tourism as a tool for the promotion of gender equality and women’s empowerment, and facilitate their access to jobs and/or create possibilities for career enhancement in tourism. View video from the PATA Grand and Gold Awards 2017, 2016, 2015, 2014 and 2013, and pictures from 2017, 2016, 2015, 2014 and 2013. Founded in 1951, PATA is a not-for-profit membership association that acts as a catalyst for the responsible development of travel and tourism to, from and within the Asia Pacific region. The Association provides aligned advocacy, insightful research and innovative events to its member organisations, comprising 95 government, state and city tourism bodies, 25 international airlines and airports, 108 hospitality organisations, 72 educational institutions, and hundreds of travel industry companies in the Asia Pacific and beyond. Thousands of travel professionals belong to the 36 local PATA chapters worldwide. The chapters organise travel industry training and business development events. Their grassroots activism underpins PATA’s membership in Uniting Travel, a coalition of the world’s major Travel & Tourism organisations dedicated to ensuring that the sector speaks with one voice and acts in unison on the major issues and includes ACI, CLIA, IATA, ICAO, WEF, UNWTO and the WTTC. The PATAmPOWER platform delivers unrivalled data, forecasts and insights from the PATA Strategic Intelligence Centre to members’ desktops and mobile devices anywhere in the world. PATA’s Head Office has been in Bangkok since 1998. The Association also has official offices or representation in Beijing, Sydney and London. Visit www.PATA.org. This entry was posted in People, Society, Tourism, Travel, Travel Awards, Travel Management and tagged Dr. Mario Hardy, MGTO, Ms Maria Helena de Senna Fernandes, Pacific Asia Travel Association, PATA Gold Awards, tourism industry. Bookmark the permalink.